CDStarter is a freeware program to put on your CDs that will present the user with a list of buttons to run software or open files on your CD. You can define your own lists and each button can have its own icon. CDStarter has support for different languages and operating systems. Now version 2.2. This version introduces requested new features including a licence agreement window, enhanced about box and window resizing. Bug fixes are also included. Version 2.2.1 was released to fix two bugs. In 2.2.0, the user interface was not always displayed in the correct language and an error occured when the language list box was used with only one language. Please download version 2.2.1 to fix this. CDStarter221.zip contains the main program file, help file and an example. To use it, just download this file, unzip it using WinZip or other unzipping utility. 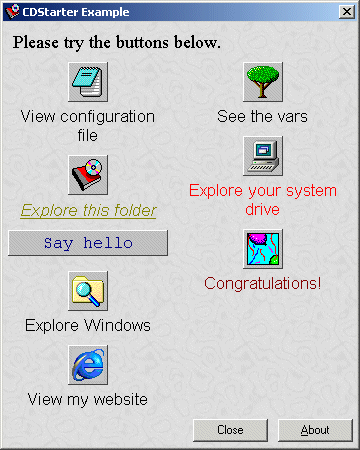 Just run CDStarter.exe and view the example. You can then create your CD autoruns straight away, using the config editor CDStarterconfig.exe. Please join the mailing list to find out about updates and developments. Note to all users: I have received recently many emails from users of CDs using CDStarter for their autorun. They have been enquiring about the content of the CD, which obviously is nothing to do with me. Therefore I recommend that you enter your own contact email address in the about box field (general tab). Copyright © 1999-2010 Richard Low. All trademarks on this page are owned by their respective owners. Hosting by Memset.